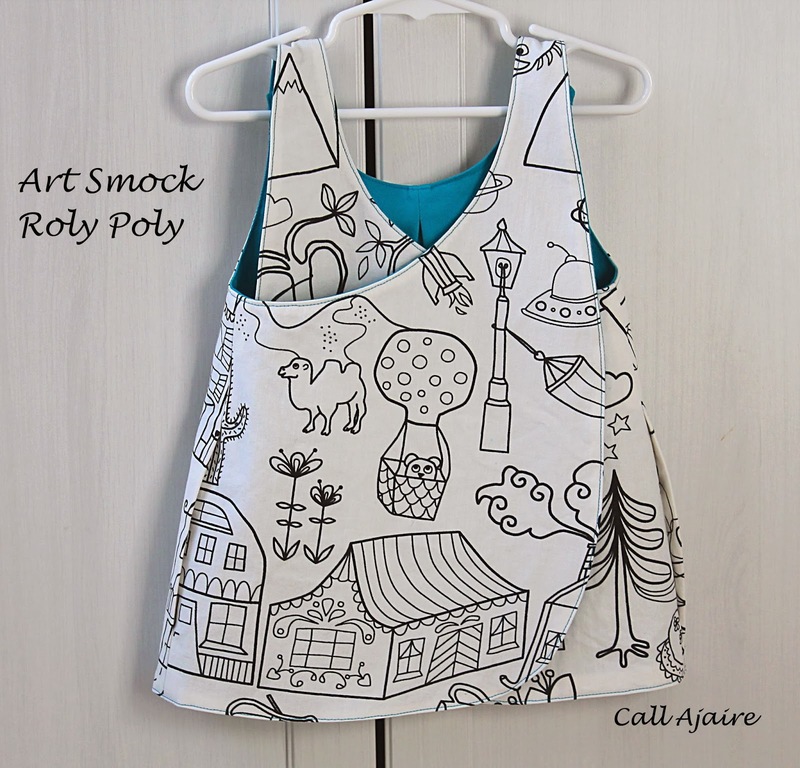 During Imagine Gnats’ winter pattern tour Tara from Girl Like the Sea posted an art smock made with the Roly-Poly Top (*affiliate link) pattern. I basically slapped my forehead when I read the post because OF COURSE. 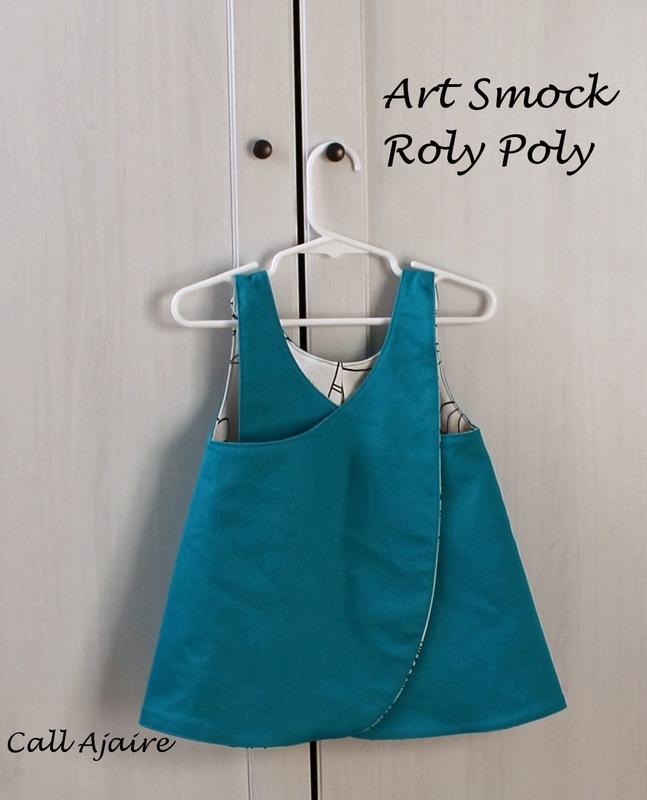 It’s the perfect simple smock pattern. Bean and I are taking an art class through the county and she needed a smock. 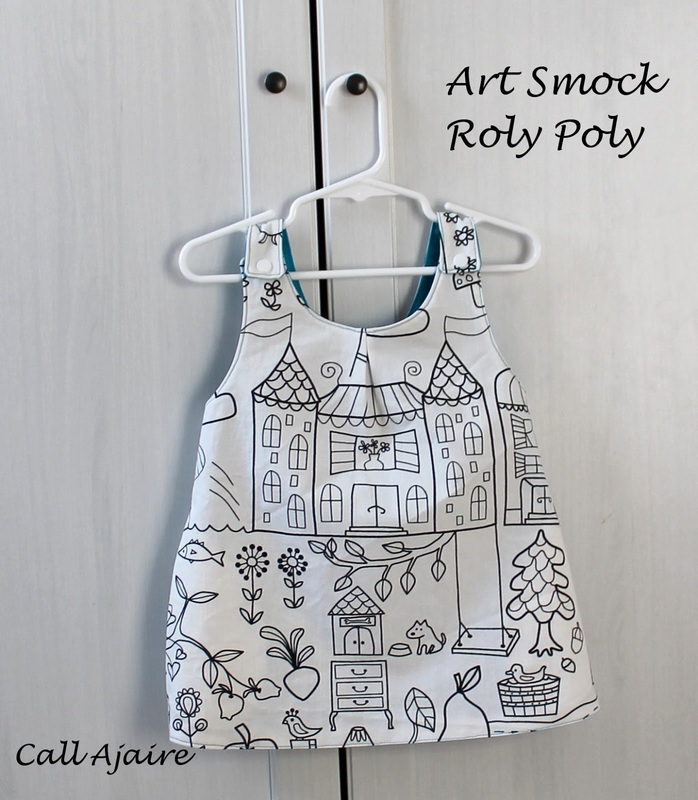 I jumped to my machine and whipped out a Roly-Poly smock in record time. The main fabric is more of that fun Tidny fabric from Ikea and I thought it was perfect as a blank slate for all the art supplies that will end up on it, hehe. 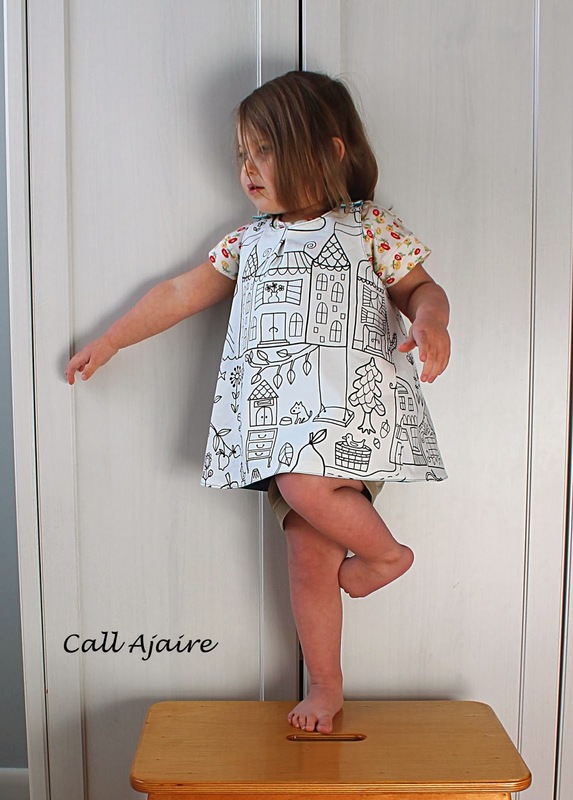 I made the pinafore according to the pattern instructions, including the pockets. Bean still doesn’t seem interested in pockets, but they are super easy to do so I figured I’d add them anyway. 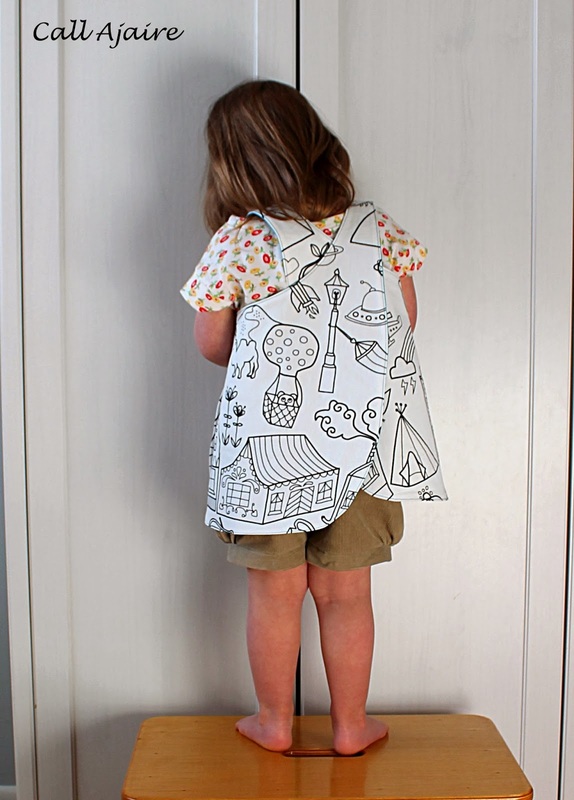 The smock is reversible, but really I’m sure she’ll wear it with the coloring fabric out most often. The blue fabric is a sateen from JoAnn. I’ve had it in my stash and the rest of it may become some pants soon (this week??). I really love the color and I’ve had great results with their sateen fabric in the past. The smock doesn’t cover her arms, but offers more than enough protection for the class. This is such a perfect KCW project. Super fast with really fun results. Definitely doable in the hour time frame. Although a lot of us end up doing way more than an hour right? I have a long list in my head of things I want to make this week so I’m sure it’ll be more than one for me. I’m excited about the class. We were supposed to start last week, but it was canceled due to snow so today is our first day. Bean is hoping we’ll be using “paint-glue” which I believe her way of telling me that those two separate things are so foreign to her that she has combined them in her head. Note to self: we need to do more crafts at home and step outside our coloring comfort zone, hehe. So cute! I'm still dying that ikea sells fabric. I've been living under a rock!! Perfect, quick project, thanks for the inspiration! !